Trent Herring (Newport Surf Life Saving Club), the 2015 NSW IRB Championships event and the Newport Surf Life Saving Club Male Taplin Team were also finalists nominated for the Sport NSW Awards. Last year fellow clubmate Georgia Miller took out the Young Athlete of the Year category. This year Callum Mills, won the Young Athlete of the Year Award. In November 2015 Callum stamped his name in the history books as the first player to attract a bid on under the AFL's new bidding system. He had been training as part of the QBE Sydney Swans Academy and now the Midfielder is thrilled to officially become a Sydney Swan. 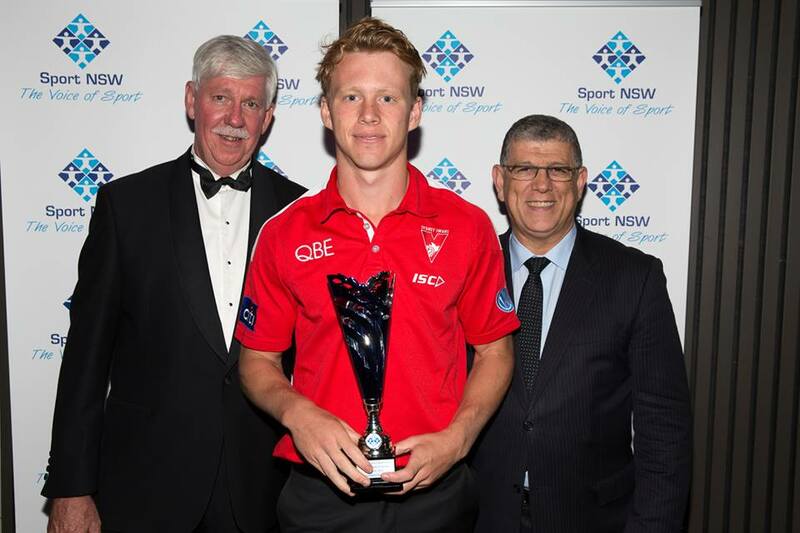 In 2014 Callum excelled for New South Wales-ACT at the under-18 championships and was rewarded with selection in the All Australian team. Grandfather Ray Mills was a former League player in Perth and for Western Australia in the 1960s. Certainly be one to keep an eye on this year. Green was crowned 2015 NSW Athlete of the Year for her role in the Australian Diamonds’ gold medal win in the 2015 Netball World Cup at Sydney Olympic Park, which also won Event of the Year at the 21st annual Sport NSW awards night at the prestigious Curzon Hall, Marsfield. A total of 15 awards were presented in an inspiring evening which also recognised coaches, administrators, volunteers, masters and young athletes and athletes and teams with a disability. Green was unable to attend the event because, although she retired from international netball after the World Cup in August 2015, she announced this week that she would continue to play in the national competition and is currently in New Zealand, preparing for the NSW Swifts season. “Netball NSW and the NSW Swifts are my family away from home, they have given me so many opportunities,” said Kim Green when thanking her state sporting organisation and team, in her video message to the audience. “I would like to thank Sport NSW for this Award, it’s just an absolute honour, I was shocked when I got the phone call,” said Kim. Green’s international retirement came after a career of successful captaincy, 109 ANZ Championship appearances and 74 appearances for Australia that include two Netball World Cup Gold Medals, two Commonwealth Games Gold and Silver Medals. She is one of Australia’s top 10 most capped players of all time. “I would just like to thank all the Athletes and fellow finalists that were amongst this group, to be named amongst you guys, I’m truly honoured, congratulations on your year as well,” said Green. This year’s event was a great success, receiving more nominations for outstanding sport achievements throughout New South Wales than ever before, surpassing the record set in 2015. The NSW Lendlease Breakers won the National Professional League - Team of the Year Award for their outstanding 2015 performance after winning both the Women’s National Cricket League and Women’s T20. Maddison Elliott OAM was awarded the Athlete of the Year with a Disability title after having a stellar 2015, continuing her run from last year when she was crowned the Young Athlete of the Year with a Disability for 2014. She dominated the swimming world with her incredible performance at the IPC championships in Glasglow, Scotland, taking home four gold medals and setting the World Record and Oceania Record in the women’s 100m freestyle. Australian Wallabies Head Coach, Michael Cheika, and Diving Australia’s Head Coach, Chava Sobrino, were among the top award winners, with the pair sharing the category of Coach of the Year for the second consecutive year. Cricket NSW was once more victorious when they claimed the Organisation of the Year Award against some fierce competitor, including Netball NSW, Equestrian NSW, Tennis NSW, Rowing NSW and Women’s Bowls NSW. The Organisation of the Year also won the Inclusion/Diversity Award for their instrumental work in developing programs to promote an inclusive environment and create cricket as a sport for all. 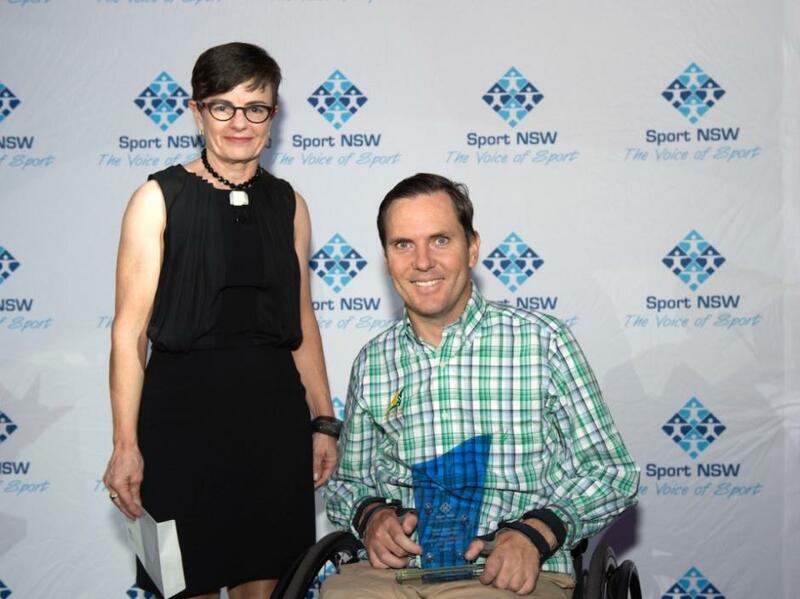 This year, Sport NSW introduced the Inclusion/Diversity Award for organisations who demonstrate outstanding commitment to the principles of inclusion and diversity in their sport or the sport industry as a whole. It is a celebration of the work being done towards building a holistic and all-inclusive sporting community across the board. Sport NSW CEO Cheryl Battaerd said that for 21 years, the NSW Sports Awards has recognised leading athletes, teams, coaches, administrators, volunteers and organisations in NSW and celebrated their outstanding achievements in high performance and community sport levels. “This awards program is an integral event in the state’s sporting calendar, providing an opportunity for the New South Wales community to unite, celebrate and acknowledge those whose contribution is the lifeblood of our state’s sporting community,” she said. NSW Sports Federation Inc. operates under the name of Sport NSW and is the active voice and peak body for sport in NSW. Sport NSW has been operating since 1991 with a membership representing over 15,000 community sport clubs and associations and 2.5 million participants, volunteers and workers in NSW sporting organisations. In 2015/2016 NSW Family & Community Services (FACS) were given Sport NSW a grant to employ an Inclusion Officer who is working with sporting organisations helping them to build capability and an environment so more people with a disability can participate in sport. In recognition of FACS’ support Sport NSW asked if they could be a sponsor of the Team of the Year with a Disability which Daniel Fitzgibbon & Liesl Tesch AM won. The lady in the photo presenting the award to Pittwater's Dan Fiztgibbon is Ms Eleri Morgan-Thomas, Acting Deputy Secretary Program and Service Design, Family & Community Services.